We are extremely proud to have a number of collies from our breeding or sired by one of our dogs working or in training as companion and service dogs. There is nothing that validates the love between man and dog more than the tasks our dogs are able and willing to perform for us. And the service dog not only performs a task, but makes a huge change in the quality of life of his partner. No achievements of my dogs make me happier than their ability to serve in this way. "Pepsi" (officially Diamond Solitaire of Netiv HaAyit) is shown here with her best friend Shawn - you can easily see how much joy they bring to each other. Pepsi helps to bring an improved quality of life to Shawn and his family. Daisy of Netiv HaAyit (tri rough female)(Shawn of Netiv HaAyit x Braz.Ch. Lakefield Love of My Life) - Daisy is working as a therapy dog in kindergardens for PDD children. Night Bird of Netiv HaAyit (tri rough female)(Ch.Don Juan of Netiv HaAyit x Ch. Royalty of Netiv HaAyit) - Niki is the companion and service dog to a child suffering from ADHD and epilepsy. New Moon of Netiv HaAyit (tri rough female)(Ch. Don Juan of Netiv HaAyit x Ch. Royalty of Netiv HaAyit) - Mandy is a therapy and service dog in a hostel for the schizophrenic. Flucky (smooth sable female) is a service dog in the Akim Hostel for the mentally retarded. Libi (smooth sable female) - is the companion and service dog for a CP child. Sara (smooth sable female) is the companion and service dog for an autistic child. Gary of Netiv HaAyit (smooth blue male) (Ch. King's Valley Frequent Flyer x Int.Isr.EuroWnr Moonlight Shadow of Netiv HaAyit) is in training as a guide dog for the blind. Tara (rough sable female) is living with her new owner, an autistic child, and is working as a therapy dog. Tawny (rough sable female) is working as a service dog for an epileptic child, identifying oncoming attacks. Patch (smooth tri female) is working as an Alzheimer's Aid Dog in Germany. Sky (smooth blue female) is working as the companion and service dog for an epileptic woman. From three months of age, she has been alerting her owner to oncoming epilepsy attacks, from 15 minutes to two hours in advance. The frequency of the epileptic attacks, formerly very severe, has been greatly reduced, and the doctor attirbutes this to the confidence and security the patient has developed because of her relationship with Sky. More about Sky - click here. 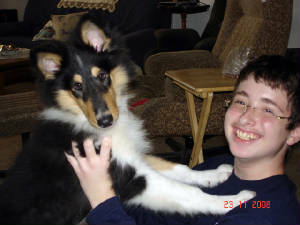 Blaze (smooth blue female) is the companion of a PDD child and working as his therapy dog. Spot (Hope of Netiv HaAyit) is in training as a service dog for an autistic young man and will soon be travelling to Australia to become his companion. More about Spot click here. Keshet (smooth tri female) has completed her training as an Alzheimer's Aid Dog and is highly successful working with her partner, providing an improved quality of life for the whole family. More about Keshet - click here. Soos (smooth tri male) is a service dog for a child with Asperger's syndrome. Chips (smooth tri male) works with his social worker partner with children at risk and the elderly. Nikki works with a severely epileptic teenager, accompanying him everywhere and giving him physical and moral support. She has been working with him since the age of 9 months. Mickie has completed her service dog training and will soon be joining her new partner. Jackson, tri smooth male, is in training to work with his new partner, a child with CP. Falcon, tri smooth male, is in training for a service dog task. Flower, blue rough female, is providing support for her new partner, aho suffers from mental and emotional difficulties. I am so proud of all these lovely dogs and wish them great success and great happiness to their owners.